Originally hailing from southern Europe, Asia and Africa, figs were thought to be sacred by the ancients; they were also an early symbol of peace and prosperity. Figs were brought to North America by the Spanish Franciscan missionaries who came to set up Catholic missions in southern California. Hence the now popular mission fig. There are hundreds of varieties of figs. The fig tree has been around since the earliest recorded history. All figs have a soft flesh with tiny edible seeds. They range in color from purple-black to almost white and in shape from round to oval. The most well known varieties today include the green-skinned, white-fleshed Adriatic; the pear-shaped, violet to brown-skinned Brown Turkey; the large, squat white-fleshed, green-skinned Calimyrna (when grown in California) or Smyrna (when from Turkey). Figs are higher in fiber than any other fruit or vegetable. This group also includes the Celeste, which is medium and pear-shaped, with a purple skin and pinkish pulp. The Kadota, a small, thick-skinned, yellow-green fruit; the Magnolia (also called Brunswick), large, with a pinkish-yellow flesh and amber skin; and the purple-black Mission (or Black Mission), with its super small seeds. Figs can have flavors reminiscent of raspberry, maple syrup, caramel, honey and almond. Figs are extremely perishable and should be used soon after they’re purchased. Figs may be stored in the refrigerator for 5 to 7 days and they are also sold candied, dried or canned in sugar syrup or water. 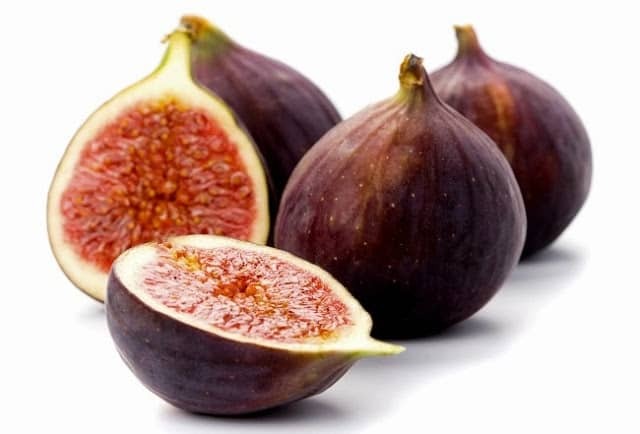 Fig concentrate is a thick, syrupy, seedless puree’ of figs. It’s used to flavor cakes and other desserts, as well as a topping over ice cream, fruit, and so on. Fig concentrate can be found in natural food stores and some supermarkets. Figs have become the symbol of abundance, fertility and sweetness. The fig was first used in a commercial product in 1892 in the Fig Newton Cookie. A delicious and new twist on an old favorite. Thaw dough until just soft enough to roll out; do not let rise. Lightly flour work surface. Roll dough into 8" x 12" rectangle. Spread 2 tablespoons butter over dough. Sprinkle cinnamon sugar, then chopped figs over dough. Roll up dough tightly (jelly roll fashion). Seal the seam, using a little water. Cut into 12 pieces. Cut 4 tablespoons butter into small pieces and spread over bottom and sides of 9-inch pie pan (or other suitable container). Sprinkle golden brown sugar over bottom of buttered pan. Spread nuts over brown sugar. Place rolls onto pan with cut sides down. Let rolls rise to approximately double in size, about 30 to 60 minutes. They will be soft and airy. Bake rolls in pre-heated oven at 350°F for 20-25 minutes or until golden brown. Remove rolls from oven, brush tops with remaining 2 tablespoons butter. Carefully invert pan of rolls onto plate and let the melted brown sugar mixture and nuts run over the rolls. Pan and butter mixture will be very hot. Serve warm or hot out of the oven and enjoy. Option - if the rolls are prepared the night before do not allow to rise. Instead place rolls in the refrigerator covered with a moist paper towel. In the morning remove from the refrigerator and allow to rise (takes about 60 minutes). If necessary, rolls can be placed in a warm oven to rise.